Information Technology Services ITS) maintains both production and test environments. While the Software Center installer will configure a connection profile for production it will not configure a connection profile for test/Development. Additionally, older installations may not have the correct connection profile for production. The following instructions will walk you through configuring or verifying the connection profiles. Information Technology Services (ITS) maintains a test/development environment to test updates and new functionality. 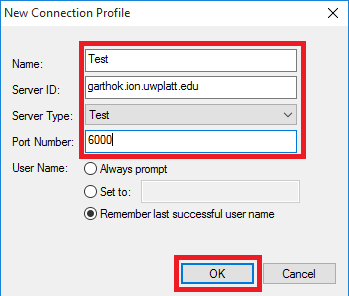 The following instruction will walk you through creating the connection profile for the test/development environment in Perceptive Content. 2. 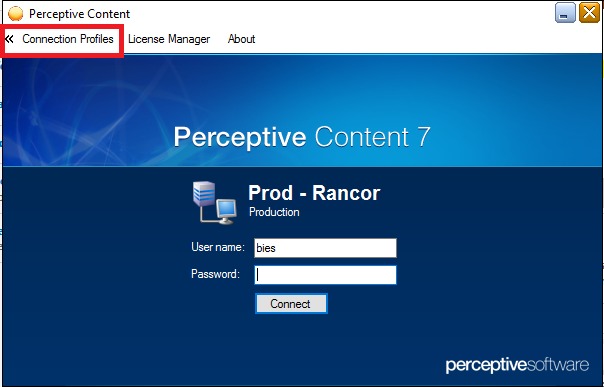 In the Perceptive Content login window select Connection Profiles to display the connection profiles. 3. Press Edit connection profiles at the bottom of the profile list to open the Connection Profiles editor. 4. 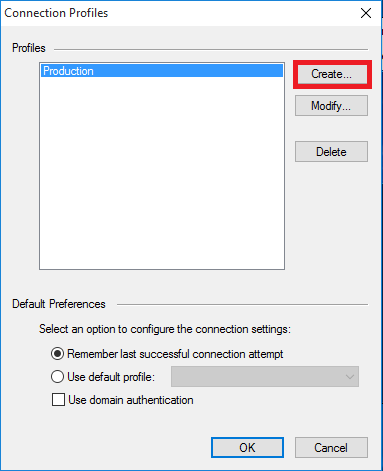 In the Connection Profile editor press the Create button to create a new connection profile. Pressing Modify will allow you to modify the selected profile. 5. In the New Connection Profile window enter or verify the following values and press OK when complete. 6. Press OK to close the Connection Profiles window and return to the Perceptive Content Login window.